As barriers to international trade and investment are eliminated, taxation becomes an increasingly important consideration in foreign investment decisions. 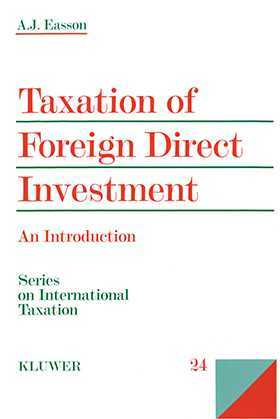 This book describes the many different ways in which national tax rules and international tax principles affect foreign direct investment decisions, and examines their impact on the establishment and operation of foreign-invested projects. The study focuses on tax provisions, in both host and home countries, which have the greatest impact upon foreign direct investment, and looks at the role of tax treaties, the methods of relieving double taxation and of countering tax avoidance. It looks at the application of these rules to specific foreign direct investment situations and examines the impact of taxation upon the establishment and operation of foreign-invested projects. It concludes by examining some of the most recent developments in international taxation, such as the growing concern over harmful tax competition, and attempts to suggest how the international tax system, as it affects foreign direct investment, may evolve as the 21st century begins. The book will be a valuable guide to tax practitioners and executives of multinational enterprises, and will be a useful reference work for students of international taxation.